1-CD with 48-page booklet, 29 tracks. Playing time approx. 79 mns. 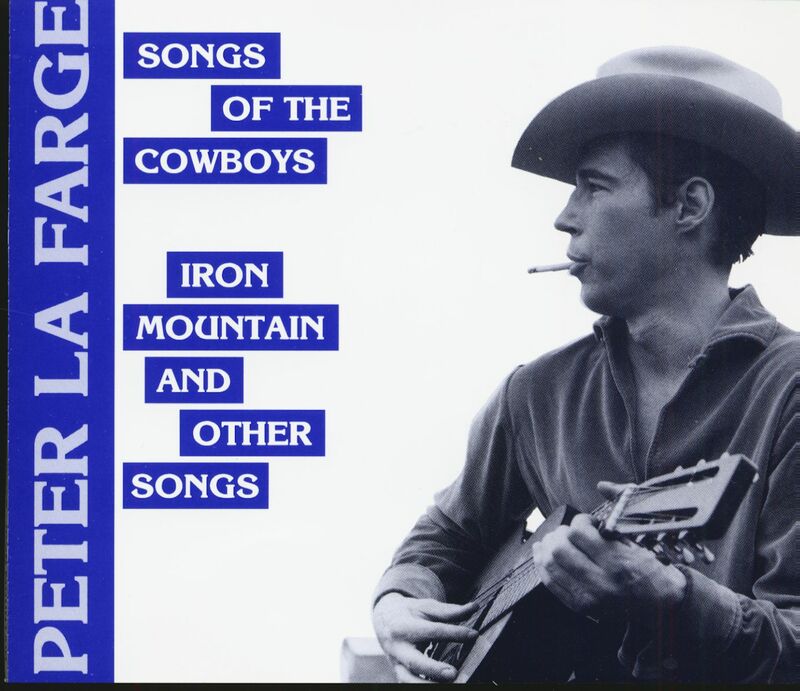 One of many ironies surrounding Peter La Farge is that he could legitimately claim to be both Indian and cowboy. 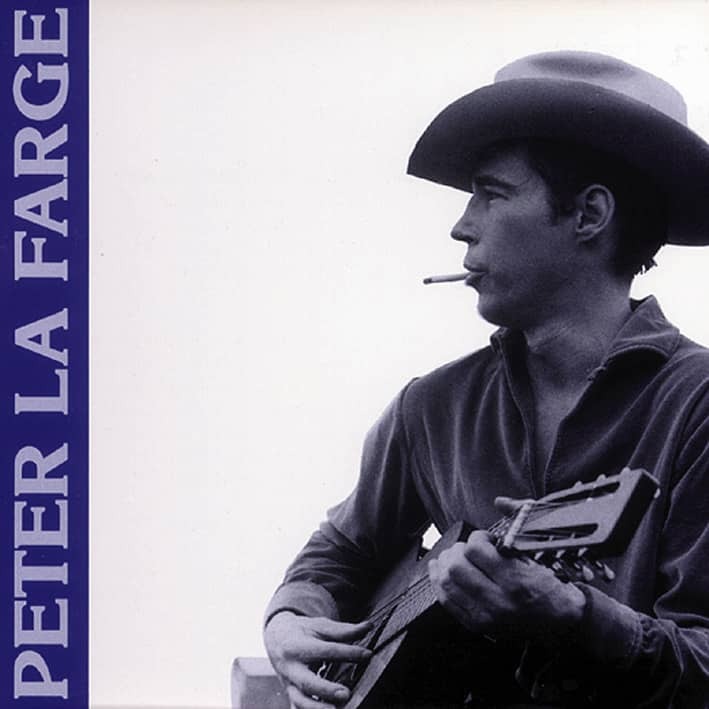 On his 1964 Folkways album of cowboy songs, La Farge delivers Western chestnuts like The Strawberry Roan with evident affection and recites a piece of original 'beat' cowboy verse, The Rodeo Hand. The 13 1962 Folkways recordings which flesh out this 29-track collection show La Farge's topical eye scanning discrimination (Alaska, 49th State), drug use (Marijuana Blues), and the passing of a mentor in Cisco Houston. Peter La Farge comes from Fountain, Colorado, where he was raised as a cowboy on the Kane Ranch. His second home is SantaFe New Mexico, where his father Oliver La Farge resides. The thirty-two year old folk musician whose tribe, the Nargasets were wiped out was adopted, with his sister Povy, by the Tewa Tribe of the Hopi Nation, whose reservation is near Santa Fe. Peter left school when he was sixteen, to sing and rodeo. He had his own radio program when he was fourteen. Peter was dancing the Hopi eagle dance with his father playing drums before he was ten, on his first ap-pearance in New York. In 1946 Josh White came through Pete' s country, and stopped off to work with him. This was the beginning of his appren-ticeship to the greats of folk music. Much work with Josh, Big Bill Broonzy and a close friendship with Cisco Houston followed with the years. 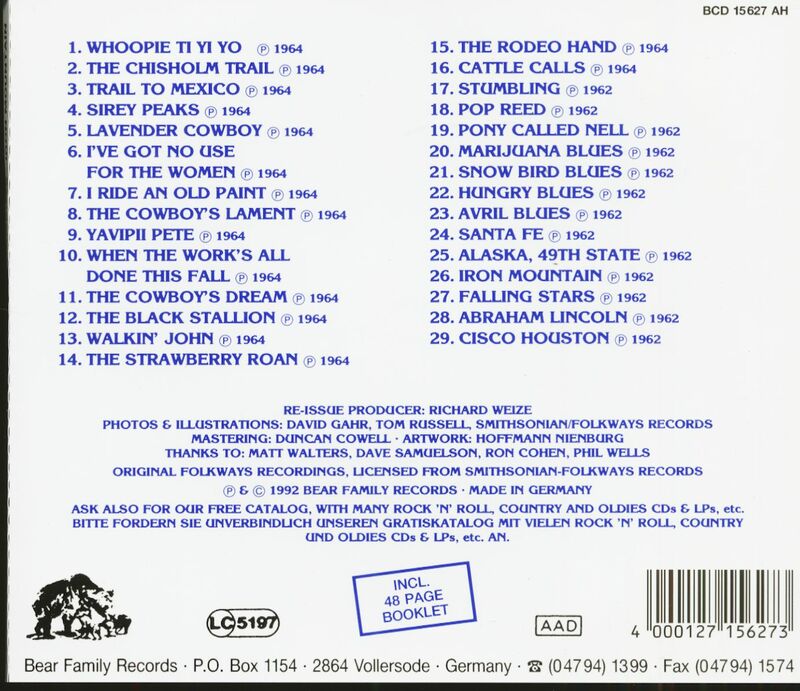 Peter went to Korea and returned to sing and rodeo, collecting the cowboy songs which are his birthright, collecting a broken nose in the ring as a professional boxer, collecting the USA. He took his eyes off a Brahma Bull at a rodeo in '56, and saw that the resulting inj ury, (through which he almost lost a leg) spelled the beginning of the end of his athletic career. He then took himself to the Goodman School of Theatre in Chicago. After appearing in New York City in the highly successful revival of 'Darkness of the Moon,' he made a comeback on the Rodeo circuit. In '59 he found himself riding at Madison Square Garden with his right foot in a cast, and a spur set into the cast; at the same time he was cast in the Shakespearwrites New York produc-tion of 'King Lear.' Pete has had a broken wrist, a mangled, surgically saved knee, a broken (but healed) leg, a crushed ankle and other injuries from rodeo. He retired. Working closely from this time on with Cisdo, who believed Peter could con-tribute much as a performer, writer, composer, he began to concentrate en-tirely on the folk field. This album, the answer to a long dream, and the other Folkways releases are the result. Record Labels: Columbia, Folkways Pete LaFarge, son of Pulitzer Prize winner and rights campaigner for the Indians Oliver LaFarge, was a talented singer and composer in addition to his versatile activities as a poet, dramaturg, painter, rodeo rider and boxer. As a descendant of the Pima Indians, he stood up for the rights of the oppressed natives of America like his father. He wrote such famous songs as "Ballad Of lra Hayes" and "As Long As The Grass Shall Grow". 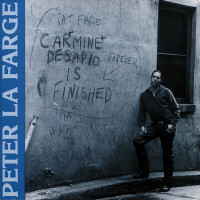 Today, when the name Peter LaFarge does occasionally surface, it is usually in Connection with some biographical / anecdotal scrap about Bob Dylan, Pete Seeger, Tom Paxton, the late Phil Ochs, or some other popular musician who emerged from New York City' s vital late 1950s / early 1960s folk music revival. Though he has been unjustly forgotten before his time (particularly when one considers that his songs were some of the most eloquently crafted of the times, and were also graphic harbingers of a coming era of political activism on the part of the American Indians), LaFarge, as a singer, and even more as a writer, was very much at the center of this movement. For a brief time, in fact, he was one of its brightest stars. And, with the possible exception of his friend and fellow folk/protest singer, Buffy Sainte-Marie, he gave musical voice to the plight of the Native American as no one has, before or since. Like his more acclaimed co-equals in the folk movement (particularly his image-conscious friend, Bob Dylan), LaFarge was given somewhat to myth-making and self-invention. Partly for that reason, his short life remains somewhat shrouded in mystery and conjecture. To country music fans, LaFarge is best remembered as the composer of a handful of angry, but impassioned Native American protest ballads which were popularized by Johnny Cash in the mid- 1960s: As Long As The Grass Shall Grow, and more particularly, The Ballad Of lra Hayes. The latter was a controversial storysong about an ill-fated Indian World War II hero, which topped the country charts in 1964. LaFarge wrote Ira Hayes and ﬁve other selections that appeared on 'Bitter Tears,' Cash 's critically-acclaimed 1964 concept LP which was devoted to the American Indian. LaFarge's recording career was launched in 1961 when he was signed to Columbia Records by the legendary producer, John Hammond, the man who signed Bob Dylan to that label the very same year. His debut LP was produced by Hammond, who also had a hand in the careers of everyone from Bruce Springsteen to Billie Holiday. In 1963, LaFarge appeared at the prestigious Newport Folk Festival. He was also a regular performer in 'Sing Out's' 'Hootenannies at Carnegie Hall. As Irwin Stambler and Grelun Landon remarked of him in their 'Encyclopedia of Folk, Country, and Western Music': "Sensitive and poetic. LaFarge was one of the ﬁrst of the American 'angry young men' who sparked the folk boom of the 1950s and '6Os. He functioned on many creative levels, providing some of the best of the 'composed' new folk music as well as turning out articles, plays, and poetry in his short lifetime." Customer evaluation for "Songs Of The Cowboys - Iron Mountain"